Even in our increasingly connected world, social isolation is a problem. In days gone by, our ancestors would have lived in communities, shared food and resources and generally lived in a more interconnected world. So what’s caused this shift, and is there a way we could return to more community-centred and healthier times for all? Even though each day we scroll through our Facebook, Twitter, Instagram and LinkedIn profiles to see the people we are connected with, it seems clear this does not truly match up with face-to-face and real-life interactions with the people closest to us. Somehow, even though it appears on the surface that we are more connected than ever before, the widespread mental health issues affecting a large proportion of our population seem an indicator of a bigger problem. Smith writes; ‘An overwhelming truth of today’s “advanced” world is, quite simply, social isolation is rapidly becoming one of the largest health risks facing the UK population. Despite technology providing more avenues of connection than ever before, we have never felt so disconnected. ‘Meaningful discussion has been replaced by cat videos, 280 characters or less and picture-perfect images of lives that, while we fully realise can’t possibly be as idyllic as the photos suggest, adds stress and focus on struggles we may be experiencing internally. ‘It’s essential to look at different communities around the world, where life is drastically different to the buzzing cities and 70 hour work weeks of the US and UK, to see where we can improve and also dispel assumptions about how to reach the elusive goal of a “quality, long life”. ‘A Brigham Young University study of tens of thousands of people found that social interaction and close relationships were the top two predictors for long life, again outweighing clean air, healthy body weight, exercise and more. Further to this, an Amsterdam Study of the Elderly reveals that those who suffer from loneliness are at a 64% greater risk of developing dementia. Smith here poses an interesting question. Perhaps the scrolling through on social media we all find ourselves guilty of (on an all too regular basis!) is an effect of something out of place in our realities. Check out this article on the build to rent sector’s rising popularity in the UK’s housing market. How might build to rent developments work to improve the social conditions of our culture? As Smith points out, ‘Through careful design and thoughtful management, we have the ability to bring vital interactions into our residents’ lives, thus enhancing their wellbeing through the home environment. The emphasis is on community creation not just property provision. 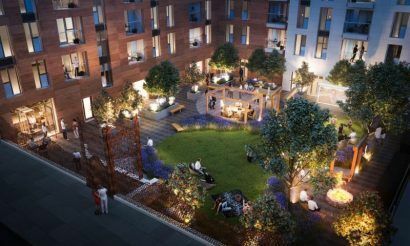 Purpose-built developments in the rental sector could be well equipped to suit the needs of key inhabitants. The provision of certain facilities, such as creating open social spaces, organising clubs and interest groups (something many of us join during university as societies, but are not always as widely available in adult life). All in all, it seems that looking forward, housing is a key way in which the UK’s property and housing industries could contribute more to positive mental health and less social isolation. Residents could one day be able to pursue more of their interests, get to know their fellow neighbours, and have a pleasant environment to return to after work, all whilst keeping it affordable and suited to the needs of occupants.